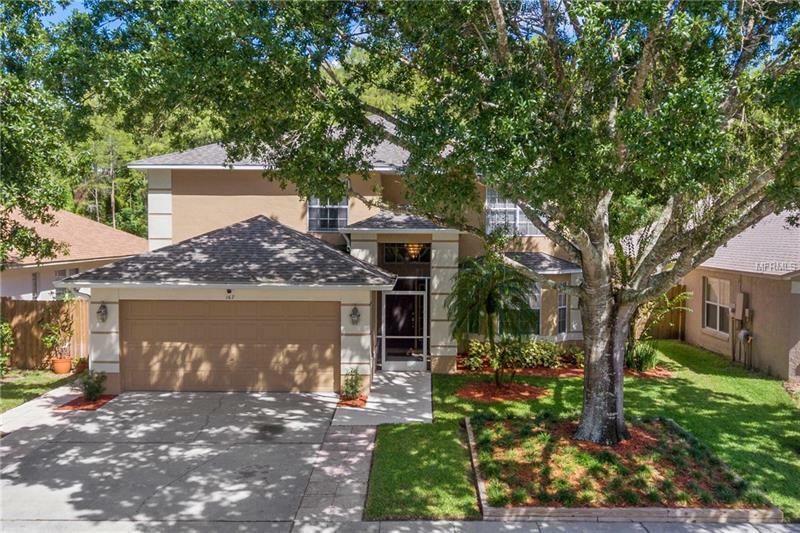 Situated on a protected and wooded conservation area lot, in this 4 bedroom, 2 1/2 bath, two story home, the main level has a cozy family room with adjoining open concept kitchen with recently updated granite countertops and marble backsplash. Also has a dining room/sitting area and a guest bedroom with half bath. The second floor has very large bonus room, perfect for home entertainment like a pool table and/or home theater (or has enough area for a smaller bonus room and an additional 5th bedroom if desired). There are two good sized bedrooms with a shared full bath, one with a walk-in closet. The master bedroom has a large walk-in closet and on-suite bathroom with large shower and tub. Infrastructure improvements include a recently painted exterior in November 2017, and professionally landscaped front yard in February 2018, new 6 foot high privacy fence in 2016, new CertainTeed - Landmark Pro roof (with additional front gutters) and remodeled screened-in pool area updated with pavers and expanded deck area, all in 2015 (and updated in 2018). The Heat pump, air handler, and water heater were replaced in 2014. HOA fees includes new Comcast/Xfinity X1 HD cable and high speed internet over fiber.